ESPN NBA 2K5 is a basketball game designed by Visual Concepts and released by Sega and Global Star Software in 2004. Some modes in the game are The Association (Season of basketball), 24/7, Street basketball, Tournament, and you can unlock bobble heads and teams. 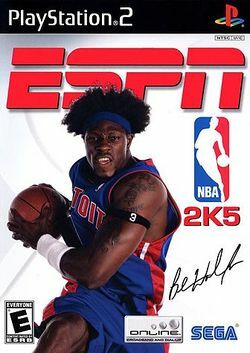 The Detroit Pistons center Ben Wallace is on the cover. Wallace was the first player to appear on an NBA 2K series cover who wasn't Allen Iverson. This page was last edited on 11 July 2012, at 18:37.